TF2 is one of the most compelling multi-player, first person shooters I've ever played, right up there with Battlefield 2. The teamwork required to play it is pretty important to success, the player classes provide a wide range of styles for approaching the game and the graphics, music and effects are laugh out loud funny. The only problem? I couldn't play it on my now standard Mac platform, at least not without a little help. I don't run Bootcamp because I'm not a big fan of rebooting my Mac Pro every time I want to run a Windows application. I tried using VMware Fusion to load up the game but even with the new beta installed I got terrible frame rates. I'm sure this has something to do with the video drivers that VMware is using. Rather than trying to tweak VMware and get it to work I decided to give Crossover Games a try. They have a version specially designed to run games on Intel based Macs and had TF2 listed as one of the games they support. Crossover is based on Wine, the open source tool that allows you to run Windows applications on a Mac or Linux machine without requiring Windows. I decided to try this out on my Mac Pro since I don't anticipate gaming on the MacBook Pro. The installation was pretty straightforward though encompasses a number of steps, all handled by the installer. It didn't take me long at all to get Steam (the application platform for launching a number of great games) up and running. I had to download the latest version of the game itself and then I was off to the races. For actual game play I'll likely run this in full screen mode. I had some problems connecting to servers initially, each telling me that the server was not responding. After trying about a half-dozen servers I was able to get in one, then after that I was able to get into nearly every one that I tried. Not sure what's up there. Crossover Games is a nice little product for the $39.95 price. It's not nearly as smooth as running the application directly in Windows and it has some little window artifacts that pop up here and there. I'm running this on some pretty serious hardware (Mac Pro, dual 2.8GHz Xeons, 12GB RAM, scads of disk space) so I'm not sure how well a lesser machine would handle it. I still think that Quake I is as good as first-person shooters get. Does it mean I'm too old to enjoy life or that I should just get a Gameboy? On a slightly more serious note, I think games have gotten too generic. I remember the days when simple, clever, well designed (graphically and gameplaywise) games dominated the Classic Mac OS. I could play Swoop for months (and many other Ambrosia titles). From the promo video, it looks like Team Fortress 2 is a great change in the direction of "good," rather than "generic." TF2 runs great with cross over games on my 17" MacBook Pro. If you buy cross over office, I think games is included now. 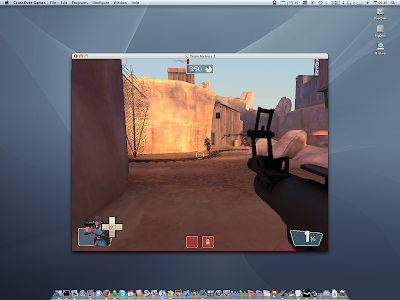 Give TF2 a try with the newly-released VMware Fusion 2.0 Release Candidate 1 build. I've played a few of the Orange Box games including Portal and Half-Life 2 Episode Two on my Mac Pro with the new Radeon HD 3870, and it runs really well! There's been a ton of performance work and optimization done on Fusion's 3D support in RC1. Definitely give it a go! @Ben: Hmmm, that's the version of VMware I'm running; just updated it yesterday. I have the ATI Radeon HD 2600 XT (256MB) - thought that clearly has plenty of horsepower to run this. The performance from Fusion is really poor in game though - I'm maybe getting 5FPS; it's really bad. David, I'm not sure if this helps this late in the game but I run Windows Vista 64bit on my Mac Pro through bootcamp and through VMWare Fusion. If I want to run a game (once or twice a month) I boot up right into Vista but if I want to do something quick I just VMWare into it from Leopard. It set up fine for me with not problems and it offers smooth frame rates. Since you already have a VMWare installation you would have to do a total reinstall to get this to work though but it is the ultimate in versatility. Thanks for the heads up on TeamFortress 2 though, I haven't checked this out since the old CounterStrike/TeamFortress 1 days. See above: Just to be clear, running VMWare Fusion through Leopard accesses the same Windows partition as when you boot from scratch into Widnows so you can access all your files using either method. tf2 rules! i use boot camp as my gaming partition on my macbook pro. i like the segregation of my gaming stuff as i'm not as tempted to stray from my work and kick some a** for an hour or so. plus, nothing will beat the performance of running games natively in windows. i finally brought my mpb to its kness last night after owning it for 6 months. i was converting flac->mp3's while running xp pro in fusion with vs 2005/firefox/ie 7open. still, i was able to surf the web and build a project. what an amazing machine! buckley - you can have fusion access your boot camp partition or it can run a windows vm. i use fusion to run a windows vm for a development environment and then save off my vm's for versioning. the new version of fusion (in beta) has unlimited snapshots which will alleviate this manual process.